New England Patriots tight end Rob Gronkowski (87) plays against the Pittsburgh Steelers, in an NFL football game, in Pittsburgh, Dec. 17, 2017. FOXBOROUGH, Massachusetts — Even as Rob Gronkowski turned in a vintage performance with his big grabs down the stretch in the AFC championship game, the veteran Patriots tight end also did plenty of dirty work. Gronkowski the blocker? The label didn’t fit in the past. But this season, one of the best receiving tight ends in NFL history and Tom Brady’s longtime favorite target made some big contributions to the Patriots’ rejuvenated running game. But Gronkowski did more of the things that don’t appear on the stat sheet. And he’s fine with that as he heads into a Super Bowl matchup with the Rams eyeing the third ring in his nine-year career. Gronkowski’s future beyond this season is once again an open question. He will be entering the final season of a six-year contract in 2019 and is scheduled to make about $9 million. Before the season, he acknowledged he would like to rework the deal, and he skipped a voluntary offseason workout. He later had bonus incentives added to his contract. 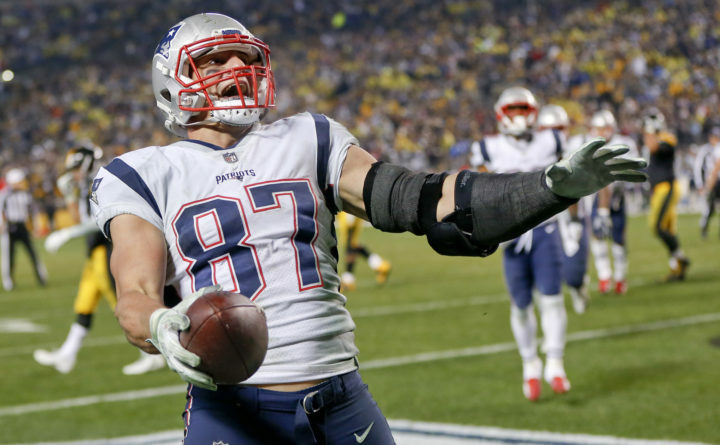 It was nothing new for the 29-year-old Gronkowski, who entered the season with 75 postseason receptions — the most by a tight end in NFL history. In the regular season, he has the most TD catches thrown by Brady to any player (78).